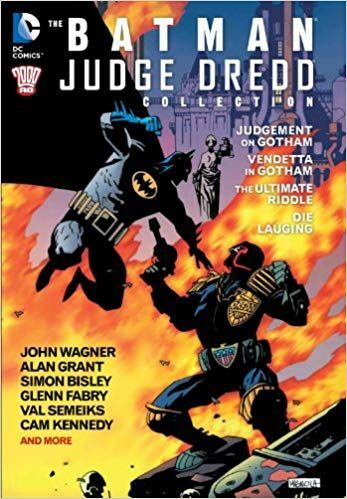 Could this be the ultimate smackdown – Batman versus Judge Dredd? Two of comic book history’s best known, and well-loved snarling heroes, each with an attitude the size of a large mountain! 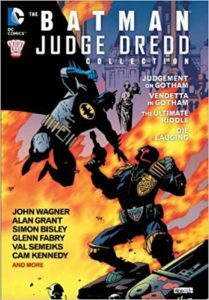 This e-graphic novel (for want of a better term) consists of two Batman/Dredd stories – Judgement on Gotham and Vendetta in Gotham. The first sees the eerie and almost unstoppable Judge Death visiting our dimension courtesy of a stolen Dimension Belt. After Batman fights him and manages to destroy his current corporeal form, he picks up the fallen belt and finds himself in Mega City One. Naturally enough, Judge Dredd takes an immediate dislike to Batman and subduing him takes him away for judgement. Psi-Judge, Judge Anderson is called in, and soon realises that Batman needs her help to defeat Judge Death before Gotham City is reduced to a charnel house. The second sees Judge Dredd appear in Gotham and pick a fight with Batman. While the two grumpy heroes duke it out across Gotham City, the nefarious Ventriloquist and Scarface execute a terrible plot to blow up a senator’s child. 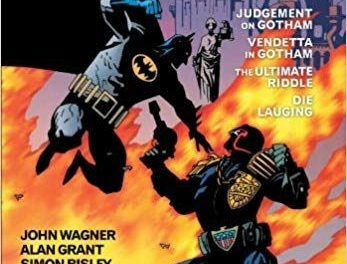 These are guaranteed to bring a smile to most comic book fans’ faces – seeing Dredd v Batman, and then seeing them grudgingly team up is worth paying out for! Some typically 2000AD comedy moments also pop up, with my favourite being Judge Death singing his own version of the Rolling Stones’ Sympathy for the Devil while gruesomely dismembering and murdering countless victims at a heavy metal concert. Action-packed, in the instantly recognisable style of 2000AD, this double act is one that will live on forever, and no doubt will feature in many more crossovers.